Ranita Dorada Amphibian Reserve, the first in the world created for the conservation of threatened species in this order, was established in December 2008, with the contribution of important institutions such as IUCN Netherlands, Dendrobatidae Nederland, Conservation International and Netherlands Postcode Lottery,in order to preserve a piece of subtropical forest inhabited by two endemic and endangered Colombia: Ranitomeya doriswainsonae and Ranitomeya tolimense, described in 2006 and 2007 respectively. Among the objectives of conservation included the following species: Cochranella rosada EN, Cochranella susatamai VU, Cochranella punctulata VU, Centrolene prosoblepon LC, Centrolene robledoi VU, Bolitoglosa lozanoi LC, Eleutherodactylus fallax EN, Eleutherodactylus penelopus VU and Eleutherodactylus raniformis VU, these species were found outside a conservation scheme directed to protecting and restoring forests in highly processed in the town of Falan North of the department of Tolima. it is located on the western flank of the Central Andes in the locality of the El llano, belonging to the village of Frias, Southwest of the town of Falan, North of the department of Tolima, Colombia (5º 01′N 75º 02′W) It covers an area of 284 acres distributed in an altitudinal range between 1.580 and 1.900 m approximately above sea level. Weather: Predominantly an average temperature between 15 and 22 ° C. The mean annual rainfall varies between 2,000 and 2,500 mm (HIMAT, 1990) in the municipality. The seasonal pattern of rainfall is bimodal type and the rainy months are mostly March, April and May. According to the classification system of life zones by Holdridge, the town can be considered as lower montane wet forest (BMH-MB) (IGAC 1977). The Town of Falan has a high faunal diversity index with records of 291 species of birds up to the present, of which 6 species are endemic to Colombia: Ortalis columbiana, Capito hypoleucus, Myiarchus apicalis, Euphonia concinna, Habia gutturalis, Atlapetes flaviceps; 40 species of mammals, of which is highlighted the presence of Saguinus leucopus, endemic marmoset EN and the nocturnal monkey Aotus griseimembra VU (Quevedo, 2002.) Additional off limits records of the Coral Snake Micrurus ancoralis and a lizard Echinosaura horridus Gymnophthalmidae for the central mountains. Additionally, a representative number of amphibians threatened with Cochranella rosada EN, Cochranella susatamai VU, Cochranella punctulata VU, Centrolene prosoblepon LC, Centrolene robledoi VU, Bolitoglosa lozanoi LC, Eleutherodactylus fallax EN, Eleutherodactylus penelopus VU, and Eleutherodactylus raniformis VU have been reported. Preparation of the Nursery capacity 40,000. Fundación ProAves anticipates a successful process of restoring the habitat of the Little Golden Frog (Ranitomeya tolimensis) designed to restore native forests in the upper part of the municipality of Falan. 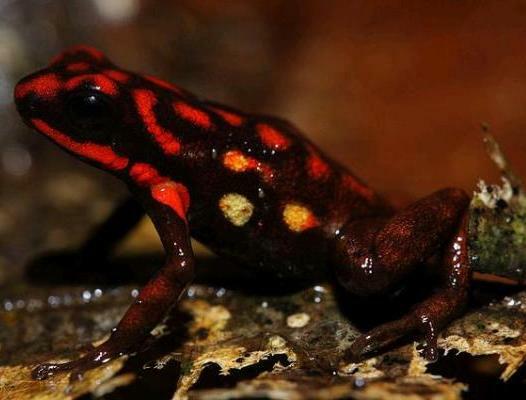 The attractive and endemic frogs of Colombia is attracting illegal traffickers from Europe. Through informants in Germany, ProAves has petitioned the Colombian government and immigration officials to be on the look-out for 4 notorious illegal frog collectors who are planning to visit Colombia soon. Due to its strategic location, Colombia is one of the most biologically diverse countries in the world, a situation that makes it vulnerable to trafficking and illegal trade in endangered species with terrible consequences for conservation. The Dutch DN Magazine, specialized in the publication of Poison-dart frog news, published an extensive article and video of the ProAves Ranita Dorada Amphibian Nature Reserve. 2008 is “The year of the frog” and ProAves is proud to launch the world’s first amphibian reserve, the Ranita Dorada Amphibian Reserve, to protect a unique forest for amphibians in the Cordillera Central of Colombia, including the Little Golden Poison Frog.